So I went to Outfit the other weekend because I needed some new clothes for work especially. I can wear pretty casual clothes for work so thought I would share what I brought with you. Outfit is a store where the entire arcadia group are located together in one store. In my local Outfit the shops are Topshop, Miss Selfridge, Warehouse, Wallis, Oasis, Dorothy Perkins, Topman and Burtons. This is a pretty good store for me to go to especially as my favourite shops are Topshop and Warehouse. In fact a lot of my clothes are from these stores. So I am going to do this by the outfit I am wearing. So for the first outfit I am wearing a basic grey tee from Topshop. At the bargain price of £10 and I have paired this with these nice navy floral culottes from Warehouse. 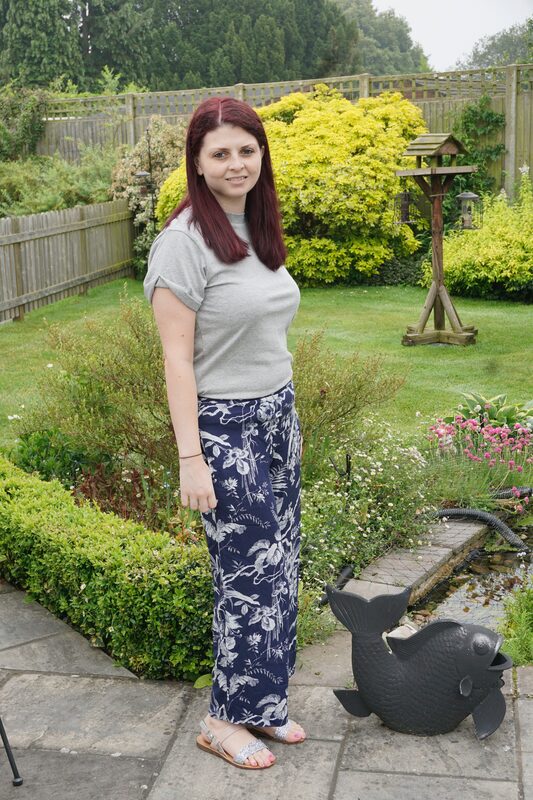 I love to wear trousers like these at the minute because my tummy is still slightly delicate and the soft fabric with any top tucked in actually is ok to wear for 8 hours or more. These are very summery and fit perfectly. Because the trousers are so patterned I think a plain basic tee is definitely a good choice to balance out the pattern. I also am wearing last year’s sandals from Office. For this outfit I am wearing the same tee as before but in pink. 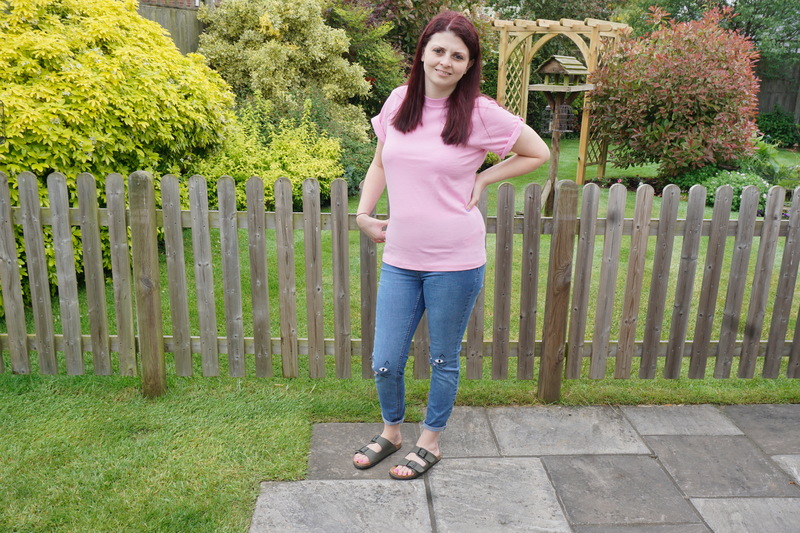 I brought this pink tee because it matched the love heart cat noses on my jeans. This is a perfect casual going shopping or for lunch with friends kind of outfit. The cat jeans are a recent diy I created then my sandals again are last year from Office. I think this would look super cute with high top converse. I think Topshop have this top in a variety of colours. I have it in five colours now. You can easily wear the pink with the culottes and the grey with the jeans. Or a completely different colour. So for my next outfit I am wearing this lovely navy blue midi dress from Oasis. Now I find Oasis a hit or miss kind of shop, but as we were walking around I saw this hanging on the rail and loved it. This dress is really simple with the detailing round the middle. I tried this dress on in the navy and a dark grey. The grey looked lovely on too but I feel that the navy suits me more. I am wearing this dress with last year’s H&M bow sandals which unfortunately aren’t available anymore. 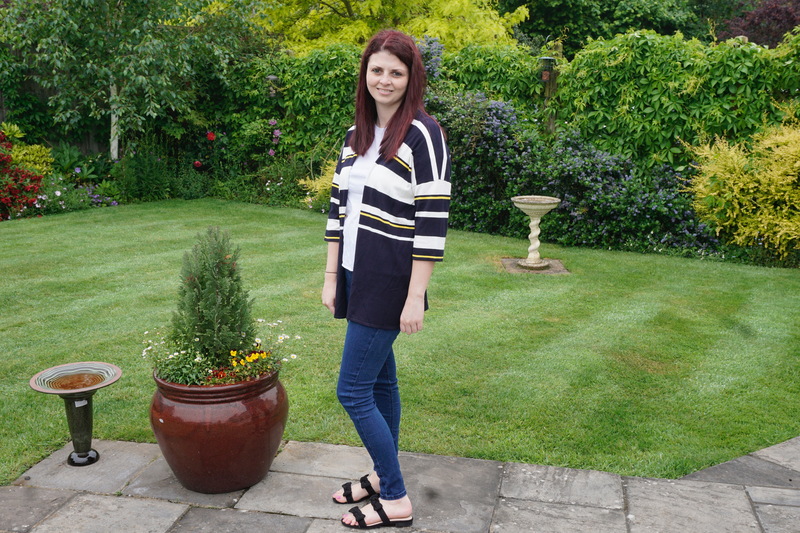 For my last outfit I am wearing my Joni jeans from Topshop. These are so comfy and the best fit jeans for me. I love a good pair of skinny jeans. Again I have my last year bow sandals on, with the basic plain tee on from Topshop but in white. I also think yellow or navy would go nice with this cardigan. I have been wanting this cardigan from Warehouse for a while now but have been unsure as to if I would really wear it. As it was in the sale I decided to just go for it. It can go with more than just jeans. It’s also three quarter length with various thickness and coloured stripes. Navy, white and yellow. If you can match a yellow to the stripe I think this would be a bolder brighter look. But the white works good too. It hangs really nice on me and is a good cover up if the weather is slightly chillier or just the typical British weather. So that is it for my Outfit haul. What is your favourite thing I brought? Also what is your favourite shop out of all the arcadia shops? What is your favourite outfit to wear this summer?